At Riobelle Siamese we wanted to explain how our kittens are raised into healthy happy cat. We place a great emphasis on healthy cats and kittens and responsible breeding with cat welfare at heart. 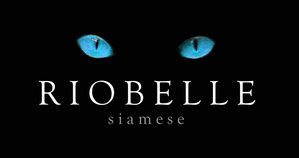 You can be assured your Riobelle kitten has been brought up with much love and care and a lifetime of support from us. We abide by the GCCF's General Code for Breeders and Owners which can be found here. 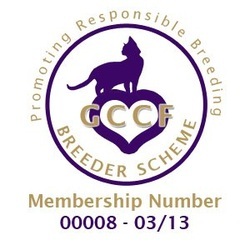 We are also members of the GCCF Responsible Breeders Scheme. This means that we have agreed to uphold a strict code of ethics for cat breeding and have been endorsed by our veterinary surgeon as having a high standard of cat and kitten care. More details of this can be found here. In the interests of kitten welfare, we ask all prospective owners to sign a kitten contract before they take their kitten home. This sets out what you can expect from us as breeders and what we would expect from you as owners in the best interests of the kitten. If you would like a Riobelle kitten, please do not hesitate to contact us either through a phone call or email. 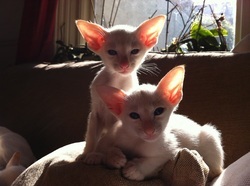 We would be pleased to talk to you about the kittens and answer any questions you may have. Please tell us a little about yourself when you enquire about a kitten. It is not that we are nosy but we have reared our kittens with a lot of love and we want to know we have found the right home. We will also be able to tell you if a kitten would be perfect for your family so please expect lots of questions. 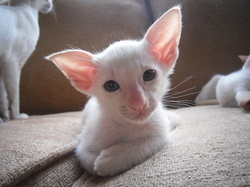 We love to hear about your family, your profession, where you live, any other animals you may have as well as if you have had Siamese cats or other cats before. We would also like to hear about anything else you may think is relevent. 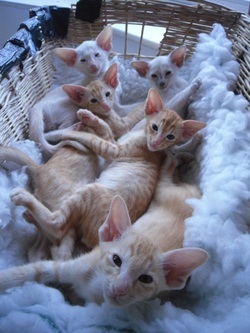 We are pleased to arrange for you to visit the kittens but we do insist on a phone call chat before any visit. We do encourage prospective kitten owners to visit the kittens and meet the mother at least once before you take your kitten home. This gives you a chance to meet the kittens properly and ask any questions you may have. However many families will visit several times before the kitten is ready to leave home. Then we get to know what a lovely home our kitten is going to and we have gone on to make lasting friendships with our kitten families. Once you have chosen your kitten you can put down a non-refundable deposit to secure that kitten. We reserve the right to change our mind at any time and return your deposit. Kittens are sold on the non-active register only. This means that you must neuter your kitten and they are not for breeding from. Kittens are available for pet / show homes. We may occasionally have potentially show quality kittens and we would be happy to advise you on this. We do not charge any more for show quality kittens then pet quality. This is because we cannot guarantee how any kitten will do on the show bench and we do not feel it is fair to charge more for one kitten that may conform more to the breed standard than another kitten regardless of their temperament. We will stand by any kitten we sell. We offer a lifetime of support and love to hear about how our kittens are doing. You are welcome to contact us at any time for advice. If at any time and for any reason you can no longer look after your Riobelle kitten or you are not happy with it then we will take it back immediately. 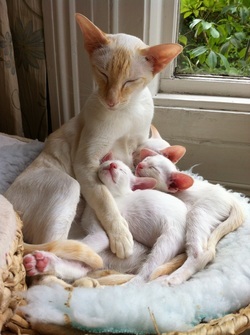 All kittens are born in my bedroom in a cosy heated bed. Once they are ready to explore the big wide world, they come downstairs to be part of our family. They sleep safely in a large kitten pen in our living room and are supervised careful while they explore our home. Once the kittens are old enough, they love the freedom to explore the whole house and often charge up and down the stairs. 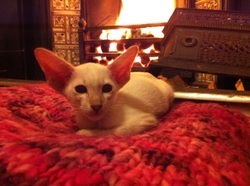 All our kittens love the coal fire and spend many happy hours playing and dozing on cushions in front of the heath. All our kittens have been raised underfoot in a busy family. They are used to people, children, other animals and all the usual household noises. My aim is to produce happy, healthy and well socialised kittens who enjoy being in the heart of the family. Kittens are ready to go to their new homes once they are 13 to 14 weeks old. This is the best age for kittens to leave home and they will be confident, well socialised and able to look after themselves without their mother by then. All our kittens stay with their mother until the day they leave home and their mother teaches them all the skills they need to be a 'good cat'. Riobelle kittens will be fully litter trained and used to a range of kitten foods by the time they leave home. Riobelle Siamese is a FELV / FIV negative househbwrhold. All our cats have full and up to date vaccination programs and are treated to prevent worms and parasites. We adhere to the highest breeding health standards and all cats are regularly vet checked. Kittens will be vaccinated against FIE, FVR & FCV (cat flu), wormed and treated with Frontline. They will also be vet checked at least twice before going to their new homes. 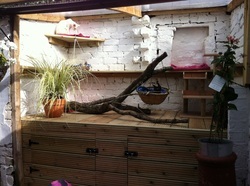 All our cats are indoor cats with access to a heated outdoor run and conservatory area. Cats love the outdoors and we believe this offers them the best of both worlds; freedom to sunbathe and explore the outdoors whilst staying safe from dangers such as traffic or diseases. Our cats love to spend lazy summer days lazing on the sunbathing shelves and beds outside or chasing through the tunnels and toys out there. We also have a leafy conservatory area with many varieties of cat safe grasses and plants for the cats to nibble or snooze in. We prefer our kittens to go to homes with safe outdoor access or indoor only homes. If you are planning to let your kitten outdoors please discuss this with us first. All kittens leave with 4 weeks free insurance with Petplan. I strongly recommend that new owners take out pet insurance or continue their insurance with PetPlan once the intial four week period is over. Vet bills are becoming more and more expensive as vets use new technology and medicines to treat pets and insurance means you do not need to worry about the unexpected or how you will pay for it. I am happy to discuss insurance for your kitten with you when you visit and PetPlan will also send you details of their cover.